Uttar Pradesh Chief Minister Yogi Adityanath on Tuesday appealed to the people of Karnataka to make the state "Congress-free" by voting like the northeast for the BJP in the ensuing legislative assembly poll. "We have recently witnessed in northeast, Tripura in particular, where people chose the BJP and have made the states Congress-free. Karnataka, too, should make the state Congress-free," Adityanath said addressing "Jana Suraksha Yatre" (a journey for people's protection) rally in this port city, about 380 km west of Bengaluru.BJP leaders from the state have been holding the four-day rally in coastal districts of Udupi, Dakshina Kannada and Uttara Kannada since Saturday, campaigning for "people's safety" after the alleged murders of party workers in Karnataka.Under the ruling-Congress government, there was a threat to safety of people in the state, the Uttar Pradesh Chief Minister alleged, addressing hundreds of party workers and general public in chaste Hindi. "As many as 23 BJP workers have been killed under the Congress rule, which allows anti-social elements to exist. If BJP workers are unsafe in this state, how will the people be safe," asked Adityanath. The Congress party in Karnataka has been "looting" public money, he alleged. "Congress party itself has become a problem for the country. 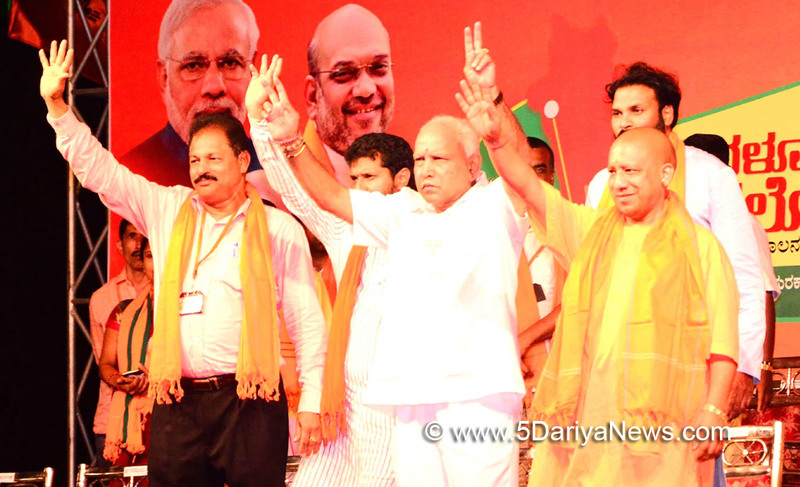 The party has not been able to bring any development to Karnataka and has only divided the society," the BJP leader asserted.Accusing the Congress government in the state of playing with the lives of farmers by not waiving off their entire loans and failing to provide drought relief in time, Adityanath asserted that his government had waived off Rs 36,000 crore loans of 86 lakh farmers across Uttar Pradesh after coming to power in July 2017. "The only answer to all this is to make Karnataka Congress-free," Adityanath reiterated.Twenty-two of the 29 states in the country had chosen Prime Minister Narendra Modi's path of development by voting for the BJP and its allies, he said.This was Adityanath's third visit to the poll-bound southern state after his first visit to Hubballi on December 21 last year and then to Bengaluru on January 7, when he addressed party rallies during the visits.The legislative assembly poll in the state is due in April-May.The BJP, which came to power in the state for the first time on its own after the 2008 assembly election, lost to the Congress in the 2013 assembly poll following a split in its state unit.